After Lehman's arrest on April 10. 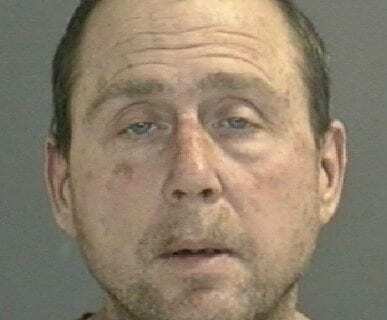 COLONIE — A 52-year-old man town man with 20 previous convictions was arrested for violating an order of protection filed on behalf of his 74-year-old mother. A judge released him on an appearance ticket, and two days later he was arrested for assaulting his mother to the point of needing medical attention. According to reports, Colonie police were called to Venus Drive at around 11 p.m. on Wednesday, April 10, but Robert Lehman had already fled the scene. He was located a short distance away and charged with the felonies of criminal contempt with physical contact and criminal contempt with a prior conviction as well as harassment, a violation. After Lehman’s arrest on April 10. The Albany County jail refused to take him as a pre-arraignment detainee because he is known to have a long history of drug use and appeared to jail medical staff to be under the influence of narcotics on that night. Judge Norman C. Massry, who signed the original order of protection, was on call that night, and when contacted by police for an arraignment, he said to release Lehman with an order to return to court on Wednesday, April 17, in front of Judge Peter Crummey. Lehman was taken, voluntarily by Colonie EMS, to Memorial Hospital but was not restrained or in custody. Two days later, at around 11:37 p.m., according to arrest records, Lehman was again arrested on Venus Drive and charged with four felonies: assault against a person older than 65, aggravated family offense, aggravated criminal contempt and criminal contempt. The assault charge is elevated from a misdemeanor to a felony because the victim is older than 65 and the defendant at least 10 years younger. His mother, according to Colonie police Lt. Robert Winn, was repeatedly punched in the face, arms and hands and suffered enough swelling and bruising to require medical treatment. As per department protocol, when there is a violent domestic case, the sergeant on duty will contact the judge on call and try to get some kind of bail or commitment in an effort to break the cycle of violence. Generally, there are judges on call 24-7, and part of that duty includes arraigning suspects on whatever charges the police arrested them for at whatever time of night. An arraignment establishes the legal groundwork going forward, and it’s at that time a judge can set bail or remand to jail with no bail. The jail, though, is under no obligation to house prisoners prior to an arraignment, said Sheriff Craig Apple, but does so out of a courtesy to the local departments in an effort to help keep more cops on the street rather than in the station watching suspects sit behind bars. Every pre-arraignment is evaluated by jail medical staff, he said, and Lehman had what Apple said was a “heroin nod” going on and not in good physical shape at all. If a judge, during an arraignment, orders a defendant locked up with or without bail, the jail has no choice but to take the prisoner. Colonie does have holding cells but they are not overnight jail cells. Rather, they are used when a prisoner is brought in from Albany County jail or another jurisdiction for court proceedings. Lehman has a lengthy criminal history, Winn said, that includes arrests for violating orders or protection, assault, larceny, drugs and DWI. He was arrested six times in connection to incidents involving his mother, including previously violating orders of protection. In all, he has been convicted of 17 misdemeanors and three felonies but has avoided doing any hard time in the state prison system. After the April 12 arrest, Lehman was sent to the Albany County jail pending an arraignment. It’s not clear when that will be or who will represent him on the six new felonies and one violation he now faces. Crummey, the town’s senior judge, could not be reached for comment. Massry did not return a message left at his office.